Chewy oatmeal cookies are Stan’s all-time favorite. Need I say anymore? 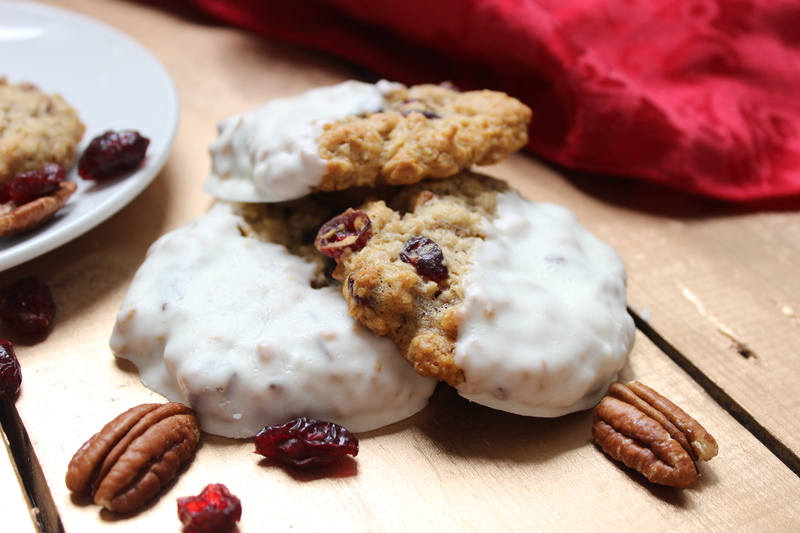 That’s enough inspiration and reason for me to make these delectable cranberry pecan cookies! 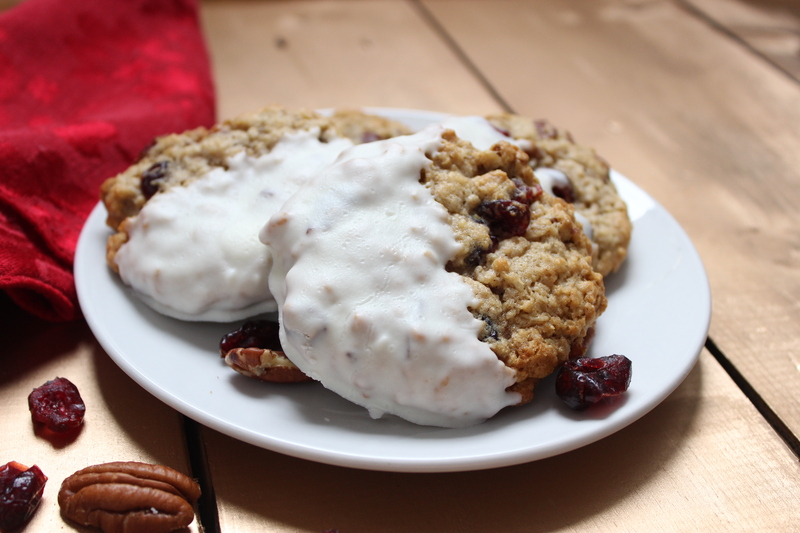 These chunky, melt-in-your-mouth cookies are the perfect addition in his lunch box. I’d say when Cranberries and White Chocolate get married the result is pure bliss. 🙂 I make a few different kinds of oatmeal cookies but this is my favorite and near the top of his lists too. 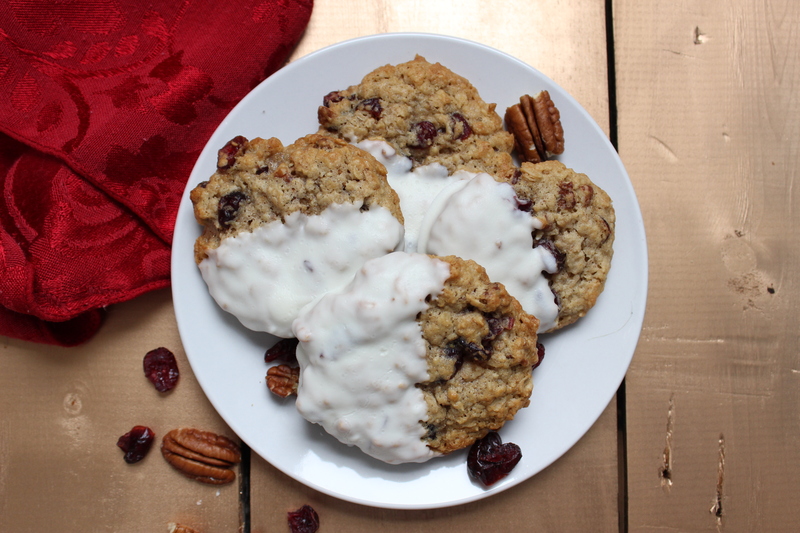 There are so many fun things you can do with the combination of cranberries and white chocolate and cookies are just one of them. 4. Add flour, baking soda, baking powder and cinnamon and mix until well combined. 5. Add oats and mix until a thick dough forms. 6. Stir in cranberries and pecan pieces. 7. Place heaping tablespoon-sized balls of cookie dough onto cookie sheet. 8. Bake 9-10 minutes. Do not over bake. 9. Let cookies cool for about 2 minutes on the cookie sheet, then remove to cooling rack to finish cooling. 10. When cookies are cool, melt white chips and coconut oil in a small bowl. 11. Dip cookies, one at a time, into white chocolate and shake to remove excess chocolate. Set on parchment paper to dry.